IV therapy in today’s world of eating fake food and being exposed to an ever increasing amount of environmental toxins, we tend to have a little nutritional reserve during times of high demand. These times include recovering from a viral illness, a major stressful event, surgery, any chronic internal stressor like an auto-immune disease or latent infection chronic toxin exposure. Many of us simply accept our new fatigue, anxiety, brain fog and lack of motivation for living our best lives. Exercise and outings becomes more of a chore. You start feeling like you are living life on a hamster wheel and just can’t jump off. Your body uses up many nutrients to build and break down different chemicals including cortisol and adrenaline – the stress hormones. It takes energy to make all of this happen! Add to that food grown in nutrient depleted soil sitting on a shelf for weeks or months certainly won’t wow you with its nutrient content. Even if you were eating nutrient rich foods, the rate of poor nutrient absorption is sky high due to the imbalance of gut bacteria – dysbiosis – that can lead to gut inflammation as well as the numerous prescription medicines that decrease vitamin absorption. A common example is proton pump inhibitors (PPIs) decreasing B12 absorption. At some point your bucket overflows and now you are constantly in nutritional catch-up mode. IV nutrient therapy bypasses any absorption issues and results in much higher nutrient availability than oral supplementation would. Because of poor nutrition and so much to detoxify, it’s safe to say most of us would benefit from a boost of IV nutrients periodically and especially during/after a period of increased demand (see above). 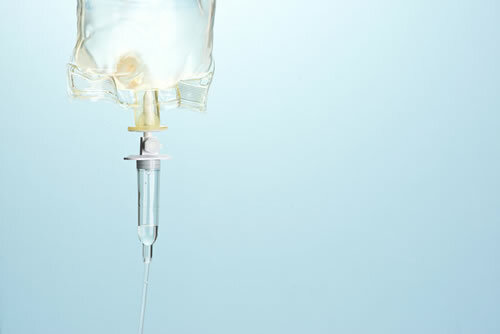 There are certain conditions when a longer course of IV therapy may be warranted. Autoimmune conditions, fibromyalgia, chronic fatigue, heavy metal toxicity, multiple chemical sensitivity, Parkinson’s, Alzheimer’s disease and chemotherapy result in significant nutrient depletion, usually accompanied by malabsorption and gut inflammation. Specifically, vitamin C in moderate doses can cause G.I. upset. The IV route overcomes this limitation and allows for higher concentration to support the immune system. Glutathione – the master detoxifier – is often broken down once ingested and poorly absorbed IV glutathione gets this essential detoxification nutrient right to the cells in much higher concentrations than possible orally. Giving your body what it needs nutritionally can allow the body to return to balance and continue healing. This holds true even if traditional medicine hasn’t been able to give you a concrete “diagnosis”. So if you’re just in need of a boost- see how your energy, mood, and focus can improve after one or two IVs. If you have a more serious chronic condition come in for a full functional medicine consult or become a member so we can get to the root cause of your symptoms and recommend the best IV protocol for you. We believe no toxin should be injected into the body when there is an alternative. We source only high quality preservative free IV nutrients from long standing premier pharmacies that have your best interest in mind (such as Lee-Silsby Compounding Pharmacy, Wellness Pharmacy and McGuff Compounding Pharmacy).